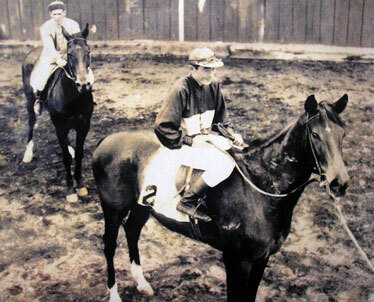 Akira Ishikawa was jockey and caretaker for the horses raised by the Baldwin family on Maui. KAHULUI » The horse track where he rode as a jockey is now occupied by a Jack-in-the-Box Restaurant and professional buildings in Kahului, and there's no longer a dairy on the slopes of Haleakala where he worked at Ulupalakua Ranch. The 43rd Annual Paniolo Parade, starting at 8:45 a.m. tomorrow at the Veterans Cemetery in Makawao, goes up Baldwin Avenue and turns onto Makawao Avenue, ending at Eddie Tam Gym. The 53rd Annual Makawao Rodeo starts at 1 p.m. tomorrow and Sunday at Oskie Rice Arena in Olinda. Parking and a shuttle are available at Oskie Rice Arena and Eddie Tam Memorial Center. Spectators parking at the arena will be shuttled to Makawao Town from 7 to 8:45 a.m. After the parade, the shuttles will run from the Eddie Tam Memorial Center and Makawao town to the Oskie Rice Arena until noon. But Akira Ishikawa, nicknamed "Jockey," carries memories of ranch roundups and a slower-paced Maui when people rode horses from Ulupalakua to Kahului to participate in racetrack events at the Maui County Fairgrounds. He also carries with him memories of working as an Army mule skinner and of fallen comrades who fought in World War II as part of the Japanese-American 100th Battalion. 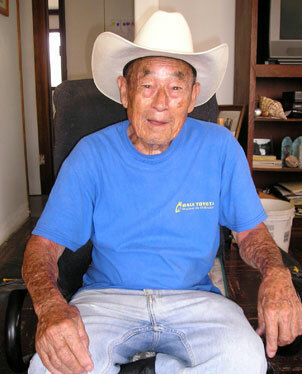 Tomorrow, Ishikawa, 89, will be riding as the grand marshal in the 43rd Annual Paniolo Parade in Makawao. "It's a big honor," he said. The event has a special meaning to him since it also pays a centennial tribute to his former ranch foreman, Ikua Purdy, who took first prize at a major rodeo on the mainland, the Frontier Days World Championship in Cheyenne, Wyo. "He was a good cowboy," recalled Ishikawa. Ishikawa's father, Ariyoshi, was a horseman himself who emigrated from northern Japan and obtained a job at Ulupalakua Ranch caring for horses. "He took care of the horses that got hurt," he said. "He taught me how to ride." "As a teenager and second oldest in a family of 13 children, Ishikawa went to work, first taking care of the calves and later as a cowboy, tending to livestock, branding cattle and going on roundups from Kahikinui to Ulupalakua. In his late teens, weighing about 112 pounds, he became a jockey and caretaker for the horses raised by the Baldwin family, who then owned Ulupalakua Ranch. Ishikawa said he and others would ride horses and lead the racing horses several miles from the ranch to the half-mile track at the fairgrounds in Kahului. He also traveled the islands in the late 1930s and early 1940s, competing in races at tracks in Kailua on Oahu and Hilo on the Big Island. Ishikawa, 89, will be riding as the grand marshal in the 43rd Annual Paniolo Parade in Makawao. Riding and caring for horses had its dangers. Ishikawa remembers his horse slipping on a muddy racetrack and running through the railing, leaving him dazed after his head struck a piece of wood. He's also been kicked by horses in several places. But the only scar left on his body is from a wound in World War II, when he was fighting for the United States and he was hit in the hip by German artillery shrapnel. Another kind of scar remains from the way the U.S. government treated him because of his Japanese ancestry. Ishikawa said he was in the Territorial Guard when Japan attacked Pearl Harbor on Dec. 7, 1941, and, because he was Japanese, although born in the United States and a U.S. citizen, his rifle was taken from him by his military superiors. He remembers he and some other Americans of Japanese ancestry in the Territorial Guard being shipped from the neighbor islands and held in a stockade for two to three weeks at Schofield Barracks on Oahu. The U.S. government later decided to allow them to fight in the Japanese-American 100th Battalion in North Africa, Italy and France, where they became the most decorated U.S. military unit of their size. Ishikawa said he was serving in a radio unit with the 100th Battalion when injured by shrapnel. After healing, he was reassigned as a mule skinner because of his knowledge of animals and led mules that carried ammunition, medical supplies and food to American soldiers in the mountains of Italy. Sometimes he hauled the dead bodies of comrades to the rear. He said the 100th Battalion sustained heavy losses and casualties, but he was fortunate because he was not an infantryman fighting at the front. After the war he returned home, and the Baldwins had his job as a horseman waiting for him. "I feel lucky to have survived the war," he said.